Mathris are deep fried salty snacks made with refined flour (maida). They are popular as a tea-time snack all over India and are quite easy to make at home. They can be consumed directly with green chutney or made into a chat as in this recipe. The chat makes for a perfect tea-time or all day snack to kill hunger pangs and satisfy the taste buds. Arrange mathris in a mixing bowl. Spread potato pieces over the mathris. 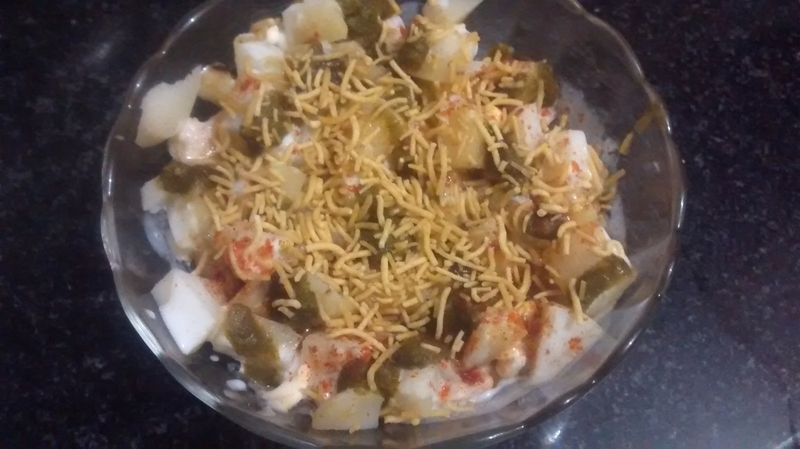 Top with beaten curd, green and tamarind chutneys. Sprinkle salt, red chili powder and roasted cumin powder. Finally sprinkle aloo bhujia over the mixture. If desired, give the chat a gentle toss to combine all flavors and then transfer to serving bowls. Or serve without tossing, when you transfer it to bowls, all flavors will combine automatically.